For individuals who spend a great deal of time in front of a desk, it is important to choose the right ergonomic office chair. They come in traditional shapes and various designs, with comfort and efficiency being the main objective. Each one is built and designed to accommodate the unique job requirements of users based on individual needs. Here are some of the different types of ergonomic designs. Kneeling Chair – Kneeling chairs are designed to put users in a semi-kneeling position while remaining comfortable and efficient. This is accomplished by inclining the seat forward and adding shin rests to support a user’s weight. The benefits of this design are based on relieving much of the weight from the buttocks and distributing the rest of the weight to the shin. This redistribution of weight makes the buttocks less stressed and allows the shins that have fewer muscles to settle comfortably on the padded rest. A back rest is eliminated in the design which allows for a wider range of upper body motion. Saddle Stool – As the name implies, saddle stools are designed for users to sit as if on a horse’s saddle. The design is simple and characterized by a curved pad placing user’s legs on each side of the curve. The stool doesn’t have any back rest, thus providing a free range of motion for the upper body. The side-legged position also gives a user adequate leg mobility. The design of this type of ergonomic chair is to keep the upper body upright and avoid back pain caused by improper back posture. 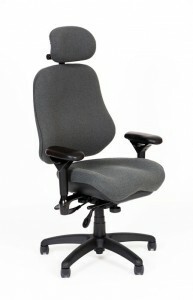 Task Chair – This is the most common type of ergonomic office chair found today. It follows conventional design but has several adjustment points that enable users to fine tune to individual specifications. It has a pneumatically adjustable height control, tensioned back rest for maintaining proper lumbar posture, and an adjustable arm rest. High Back – The high back is similar to the task chair except with a high back rest and extra features geared more towards luxury. Most high backs are purchased for executives in full leather with an array of adjustable features for lumbar support, head rest, arm rest, and even a heated massage feature. Stand-up Chair – The stand up chair is another unique ergonomic design where a user doesn’t necessarily sit but instead may only lean back on it. It is equipped with a back rest, seat pad at almost horizontal angle, arm rest, and foot rest. While this type of design is far from convenient compared to all the other choices, it is useful for those who work most of their time standing up such as when inputting data. Ergonomic chairs focus on user convenience and comfort which is achieved by offering various forms and shapes to accommodate individual and unique user needs. Hopefully this article has provided helpful information regarding the various types, usage, and advantages of ergonomic office chairs! The Ergonomic Chairs Store Can Supply You With Ergonomic Office Chairs! Does your office need to find great ergonomic office chairs? Call the Ergonomic Chairs Store at 979-217-3044 to find the right seating for your workers!